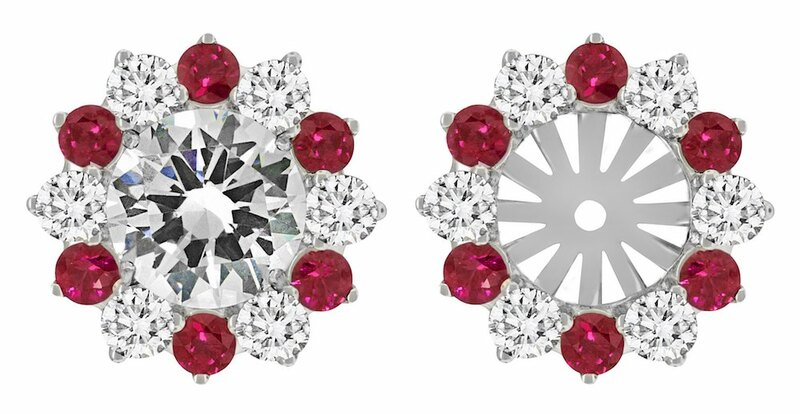 Highlighting emerald, sapphire, and ruby designs, the Classic Color collection has made a statement from the start and is the perfect way to live colorfully. Featuring sparkling gemstones paired with diamonds, the timeless color stone collection includes necklaces, pendants, rings, bracelets, and earrings. Create a completely custom jewelry look with stackable rings. Offered in blue sapphire, yellow sapphire, pink sapphire, ruby, green garnet, white diamond, black diamond, and rose, white, or yellow gold, mix and match your favorite rings for a stylish stack that’s all your own. Dress up your round diamond studs with sparkling diamond earring jackets. Set in 18K white gold, the round, floral, swirl, and geometric designs are the perfect way to transform your classic diamond studs into a distinctive look for evening or special occasions. One-of-a-Kind pieces include a fiery opal and green garnet pendant, a diamond and fancy sapphire necklace, and a velvety blue tanzanite and diamond ring. With distinct and unique designs, the spectacular collection makes a striking and unforgettable statement. Offering colored gemstones, diamond jewelry, and one-of-a-kind pieces, Spark Creations gives signature jewelry styles a modern twist. Visit us today to view the collections and discover the beauty of color stone fashion jewelry.